The RLO-10 Relay Output Module provides three solid-state relay outputs for interfacing external devices to the LD-250 or LD-350 alarms and strike indicators. External devices such as PLC inputs or auxilliary indicators can be activated when the LD-250 or LD-350 alarm activates. .. 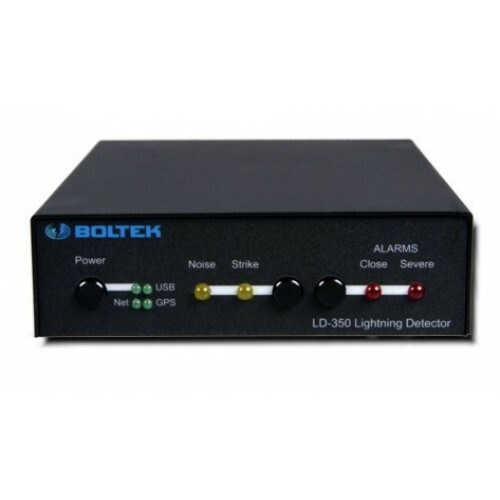 The Boltek LD-250 Lightning Detector puts a live lightning map on your laptop or desktop computer. Within milliseconds of a lightning strike the detector beeps and your computer displays the strike location. The LD-250's direction-finding antenna measures lightning strike direction while the LD-250's receiver estimates distance from received signal strength. Advanced signal processing in software improves distance accuracy, reducing the effects of strike-to-strike variations in strike energy. ..
for use with StormTracker or LD-250.. The Boltek LD-350 Lightning Detector puts a live lightning map on your laptop or desktop computer. Within milliseconds of a lightning strike the detector beeps and your computer displays the strike location. The LD-350's direction-finding antenna measures lightning strike direction while the LD-350's receiver estimates distance from received signal strength. Advanced signal processing in software improves distance accuracy, reducing the effects of strike-to-strike variations in strike energy.